2.5 Gallon Sprayer. 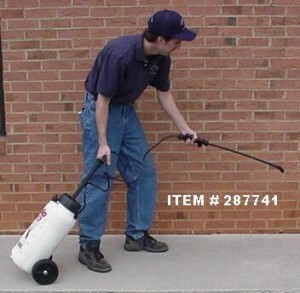 This is our 2.5 gallon Rollabout Sprayer which has all of the features as the One Gallon Heavy Duty Solo sprayer but is twice as large, comes on a pair of wheels so you are able to wheel it around the yard and it features a longer hose attached to the spray wand. It has all the same filters, the same attachments and is capable of any of the jobs the 1 gallon can do. However,it is more suited for outside applications. Since it can be rolled around, the extra weight due to the larger tank capacity is easy to move through the yard. If you need a good garden or yard sprayer and want a sprayer that can hold a little more than the traditional 1 gallon and is easy to move around, this is the one for you. The following options are available for this sprayer.